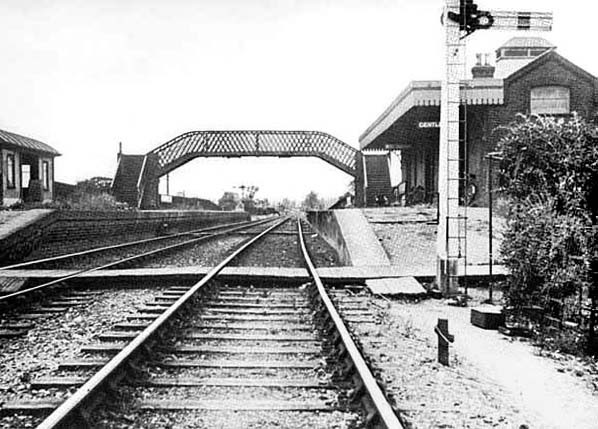 Notes: The original Aylesbury & Buckingham Railway station, which was situated to the north side of a level crossing, had a single short platform with no buildings. A small hut and cottage were provided for the gatekeeper who also served as the station's porter; a single-lever ground frame controlled access to a short siding opposite the platform but there was no signal box at this time. When the Met took over the A&BR on 1 July 1891 the track was re-laid to main line standards and the station was entirely rebuilt with a longer platform. The line was doubled, and a down platform was built on the site of the former siding. 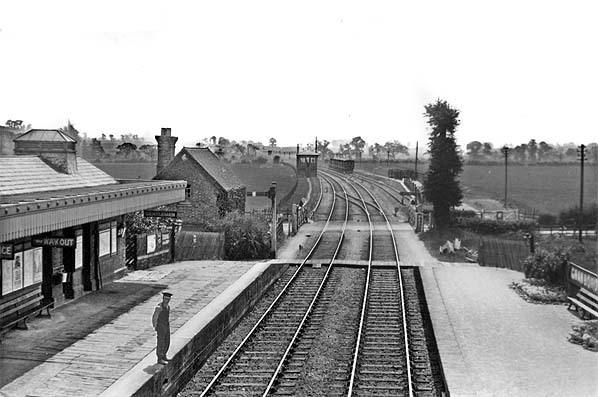 A single-storey rectangular brick building with a pitched slate roof was provided on the up platform. This included the booking hall, booking office, waiting rooms and toilets. The toilets were at the south end of the building with a ventilator on the roof. There was a short canopy over the entrance door in the centre of the building and, on the platform side, a flat-roofed canopy with a deeply fretted valance ran the full length of the building. The original gate keeper's cottage was replaced with a new larger house with its own well. The down platform was provided with a timber waiting shelter with a curved roof. 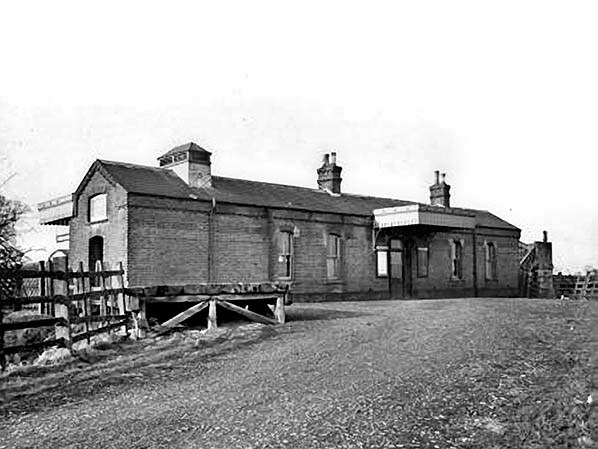 Identical buildings, main building and waiting shelter, were provided at both Winslow Road and Quainton Road; those at Quainton Road are extant and fully restored. 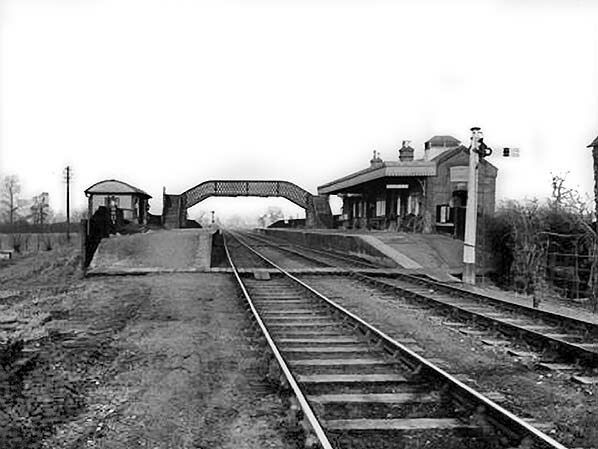 The two platforms were spanned by a lattice footbridge supported on brick towers which included two small stores. Similar footbridges can still be seen at Wendover and Amersham. A new goods siding was provided to the south of the level crossing on the down side; this comprised a long loop with a short siding at each end. The 1904 Railway Clearing House Handbook lists the station as handling only general goods and parcels, but in later years there was considerable freight traffic especially cattle which were loaded from a dock adjacent to the north siding. Cattle pens were built on the dock. Access to the yard was controlled by a signal box opposite the cattle dock on the up side of the line. The station was originally called Grandborough Road as was the village it served but this was changed to Granborough Road on 6 October 1920. The village name also changed. Granborough Road saw little passenger traffic, which may be attributed to its rural location; it served the villages of Grandborough to the east and Botolph Claydon to the west. It closed to both passenger and goods traffic from 6 July 1936. In recent years Granborough Road station found fame when it was mentioned in the 2012 James Bond film Skyfall. The villain of the piece, Silva has escaped from MI6's underground reserve headquarters into subterranean London. This is demonstrated by a CGI map of 'subterranean London', extracted from Silva’s laptop by Bond’s realisation that the decryption key is 'Granborough Road', a closed Underground station. Bond really knows his stuff as he knew Granborough Road was on the Metropolitan Railway’s long extension into rural Buckinghamshire, and near Verney Junction in particular; it closed in 1936. There was even a piece of incidental music called 'Granborough Road'. After closure, the track was eventually lifted,although the northern section of the route between Verney Junction and Winslow Road was retained until 1957 for the storage of condemned rolling stock, with the track finally being removed in 1961. Looking south from the Granborough Road footbridge towards Quainton Road in 1933. Note the ventilator on the roof of the station building; this is above the gents’ toilets. The goods yard is seen on the south side of the level crossing. See below maps for an enlargement of the goods yard. 1878 1:2,500 OS map shows the original layout of the station as built with a single track. There is a short platform without buildings on the up side of the line. A short siding is seen opposite the platform. The gate keeper's house is between the platform and the road. The gate keeper also acted as station porter and was the only member of staff at this time. Note the original spelling of Grandborough. 1899 1:2,500 OS map shows Grandborough Road station after the line was doubled. The original platform has been rebuilt to nearly twice the length with a down platform opposite. The main building is seen on the up platform with a waiting shelter on the down. The original gate keeper's cottage has been replaced with a new larger stationmaster's house. The 'W' next to the house indicates a well. As the second track is built on the site of the goods siding a new siding has been laid to the south of the road; this is in the form of a loop with a siding at each end. A signal box has been provided at the north end on the up side. Enlargement of the picture above shows the layout of the goods yard. A number of vans are seen on the loop. A cattle dock and pens are seen on the right. The 1904 Railway Clearing House Handbook listed the station as handling only general goods and parcels, so the dock is clearly a later addition when there was a regular despatch of livestock. Granborough Road station looking north towards Verney Junction from the level crossing in February 1934. 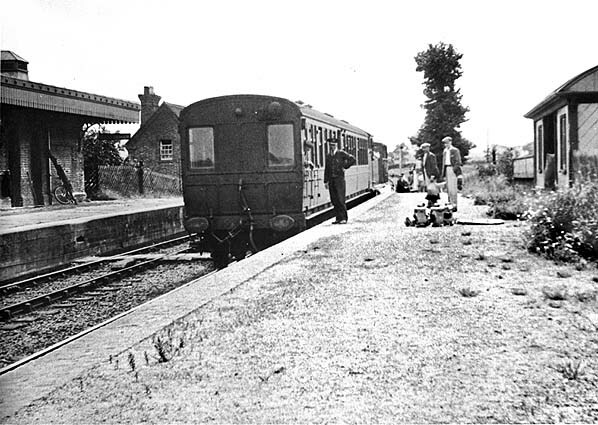 The waiting room seen on the down platform is identical to that on the now restored Quainton Road station. The The building there now houses an exhibition on the Brill tramway. Granborough Road station entrance in February 1934. The wooden platform on the left was for milk churns arriving by horse and cart. Although the line crosses the road on the level note the slope up to the station entrance. The same is noted at Winslow Road. A 'pull-and-push' service heading for Verney Junction. At Winslow Road a separate stationmaster's house was built in the twentieth century; here the original gate keeper's cottage was replaced with a new house seen here. The building has now been demolished. 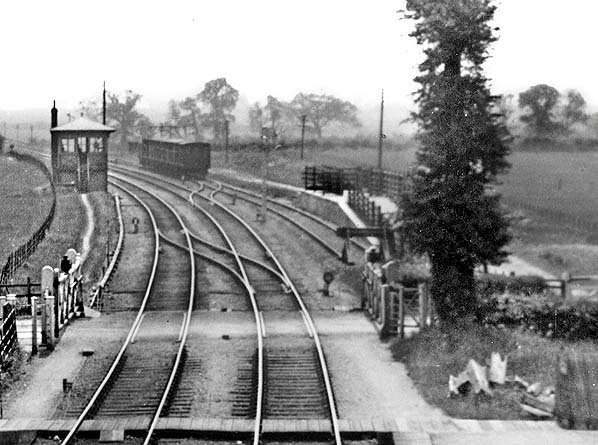 Granborough Road station looking north towards Verney Junction from the level crossing c1936. 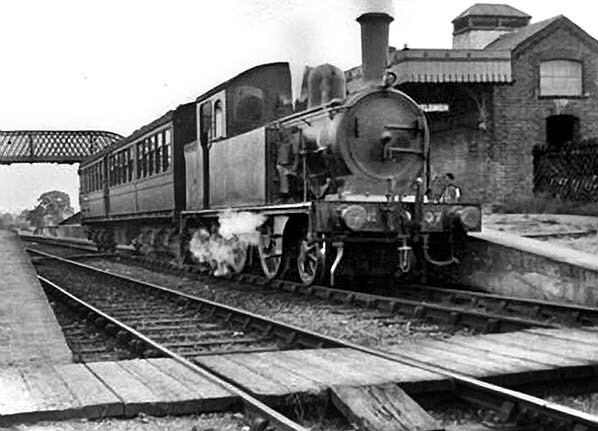 A southbound train is seen in the up platform at Granborough Road station c1936 hauled by F78307. S.D. Holden designed these small 2-4-2T locomotives in 1909 for light passenger services. They were never a great success, and only twelve F7s were built at Stratford works. The F7s were used for lightweight branch line work in East Anglia. Although they were never very popular, the F7s were capable of hard work when required. At least one account exists of an F7 pulling a ten-coach train into Liverpool Street after the original locomotive had failed. Withdrawals started in 1931, but the last two survived just into Nationalisation and were withdrawn in November 1948. 8307 was withdrawn on 31 July 1943. None of the class has survived into preservation.